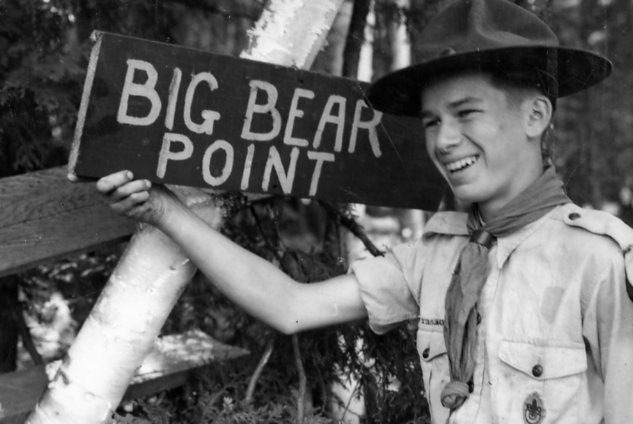 At the close of World War II, the Toronto Scout District (eventually to become the Greater Toronto Region) asked their Camping Committee to find a suitable location within reasonable driving distance from Toronto, for a rugged area of land available for a scout camp for older scouting members. After months of searching, they discovered that the Mill Valley Lumber Company was completing timber cutting on 4,150 acres in Dudley Township in Haliburton County. Following a $25 down payment, the council approved the purchase of 4,150 acres at $3.75 an acre, and thus the original HSR, then named Camp Kennabi, came into being in the fall of 1946. Most of the original buildings were those used by the lumber company and many are still in use, such as Kennaway, Mill Valley and Cooky Cabins and Kennabi Lodge. Additional acres were purchased in the following years to complete the Reserve as we know it today. The first troops camped in 1947 on the north shore of Kennabi Lake, with one canoe and two army trucks (bought from War Assets for $325 each) being the transportation available. These were the 81st Toronto from Rosedale United Church, the 22nd Toronto from St. Paul’s Anglican Church (Bloor Street) and the 101st Toronto from Windermere United Church Swansea. The first sites in use were Twister Point and Big Bear. Field Commissioner James C. Moore, known to all as “J.C.”, was the first Camp Chief, with a staff of 5 Scouts. JC was the person instrumental in finding the property which was to become HSR and served as the Camp Ranger for 25 years until his death in 1972. Moore Lake and the JC Trail were named in his memory. Today the staff number more than forty young men and women who continue to be led by experienced senior staff. A building campaign was undertaken in 1949 with the original camp hospital (now Bayview Lodge), Pow-Wow Lodge and the Kitchen at the Rotary Hub being built. Since then, several staff buildings and many new program facilities, etc. have been added. A new hospital was built in 1985 and a new Country Store and Administration Office built in 1991 and dedicated to the memory of another long time Camp Ranger, Jack Dobson. 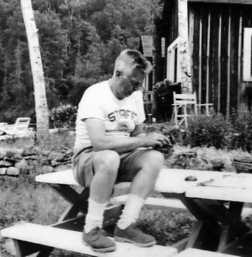 The original camp headquarters, Kennabi Lodge was restored in 1994 by the HSR Staff Alumni and dedicated to the memory of a 23 year veteran staff member, Frank Standing. In 1952 a composite troop from the Toronto North Area was the prototype of this style of camping, which grew to become, in 1953, Camp Kennaway. Both camps continued to prosper and grow until 1960 when, due to duplicate administration and mounting costs, the two camps merged into one – the Haliburton Scout Reserve. Since that time, the Reserve has become what is the largest Scout Camp in Canada and the summer home to countless thousands of Scouts and Scouters from all over Canada, the United States, Britain and many other countries. The article above is excellent, and mostly accurate, but I can offer a few minor corrections: 1. the Rotary Hub was constructed during the summer and autumn of 1953. 2. The first expiremental Composite Camp was also in 1953, for only three weeks, held on Doe Island, within sight of the North Shore of Kennabi which would become the permanant site of Camp Kennaway starting in 1954. The 1953 Composite program was headed by Jim MacFarlane with a staff of 8, and was funded by a charitable organization called the Atkinson Foundation. This information can be found in a Toronto Star article published July 27, 1953. 3. The name “Haliburton Scout Reserve” was first used in 1954 to designate the entire property that hosted three sub-camps, which were “Camp Kennabi”, that had a separate staff to service the Lake Troops staying on Kennabi, “Camp Kennaway”, which was a large composite troop program, with up to 560 campers per summer (80 campers per week over 7 weeks of operation), and the “Hurst Lake Rover Camp”. Camp Kennaway was located in the newly constructed facilities on the north shore of Kennabi surrounding the Rotary Hub. Staff and Program buildings included the “Land Ship” Programme Centre, the Nature Museum (later known as Northern Lights cabin), etc. The Composite Program only operated for 5 years under the name “Camp Kennaway” from 1954 to 1958. The first 3 summers, 1954-1956, the particpating scouts ate in the hub with meals prepared by a professional staff. In 1957, the composite troops first prepared their meals on their own sites, the same as the lake troops. 1957 was the beginning of the “merging” of the Camp Kennabi and Kennaway Staffs, with both Staffs eating now in the Rotary Hub. Previously, Camp Kennabi Staff had eaten in the Camp HQ (Kennabi Lodge). But the Camp Kennabi Staff had grown over a decade, and more space was needed, and the first duplication of staffing was reduced in 1957 by having a single professional Kitchen Staff providing meals for both Camp Kennabi and Camp Kennaway Staffs. By 1959, all duplication was eliminated by having a single Haliburton Scout Reserve Staff, and the names Camp Kennabi and Camp Kennaway were dropped. Previously there had been independant Administrations, Maintenance, Programme, Kitchen and Q.M., etc. Only the Camp Doctor and Nurse were shared by both Camps from 1954 on. Also starting in 1954, souvenir camp crests with the name “Camp Kennabi” were no longer produced. This was the first year that the Camp Crests featured the new name “Haliburton Scout Reserve”.There were only 3 different designs of the Camp Kennabi Crest produced from 1947 to 1953: 2 versions of the “Fleur de lis” (green on yellow felt and yellow on canvas-backed green silk), 2 versions of the “Camp Gates” (also green on yellow felt or yellow on green silk), and “Smokey the Bear” (only on green silk). George Kerr, the Camp Kennabi Administrator through much of the 1950s, remembers the felt crest being the economy option, costing only a dime, while the canvas-backed silk crest was the premium choice costing twenty-five cents. Hi Margaret, I missed your comment from a year ago until just this week. If you have photos or other memorabilia from those years to share that would be great. We have an active camp archive and a museum display, and we’re always looking to add to the knowledge base and collection. Do you recall a Totem Pole being carved during 1949? It was supposedly carved that year by Syd Young of the 40th Toronto. It became the symbol for the Scout Reserve, and has appeared on crests, etc. since. http://www.amazon.com/Esther-and-Richard-Provencher/e/B00O8K9UKE. Working at HSR has been a blessing in my life. Thank you all for your friendship.